The Prosci definition of change management: the process, tools and techniques to manage the people side of change to achieve a required business outcome. "What is change management?" This is a question you may have heard from colleagues or coworkers in passing or in formal presentations. While many of us know intuitively what change management is, we have a hard time conveying to others what we really mean. In thinking about how to define change management, it is important to provide context related to two other concepts: the change itself and project management. Change management and project management are two critical disciplines that are applied to a variety of organizational changes to improve the likelihood of success and return on investment. While there are numerous approaches and tools that can be used to improve the organization, all of them ultimately prescribe adjustments to one or more of the four parts of the organization listed above. Change typically results as a reaction to specific problems or opportunities the organization is facing based on internal or external stimuli. While the notion of becoming “more competitive” or “closer to the customer” or “more efficient” can be the motivation to change, at some point these goals must be transformed into the specific impacts on processes, systems, organization structures or job roles. This is the process of defining the change. Project management is the application of knowledge, skills, tools and techniques to project activities to meet project requirements. Project management is accomplished through the application and integration of the project management processes of initiating, planning, executing, monitoring and controlling, and closing. Change management is the process, tools and techniques to manage the people side of change to achieve the required business outcome. 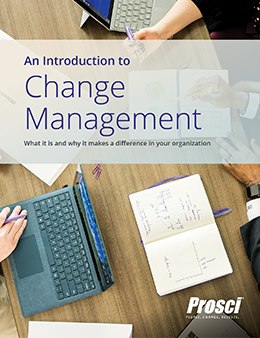 Change management incorporates the organizational tools that can be utilized to help individuals make successful personal transitions resulting in the adoption and realization of change. 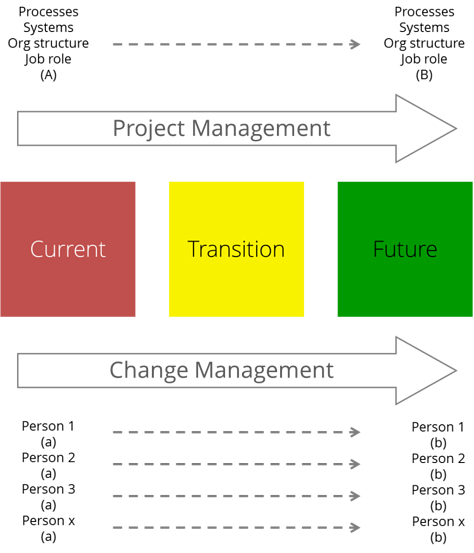 As shown above, both project management and change management support moving an organization from a current state (how things are done today), through a transition state to a desired future state (the new processes, systems, organization structures or job roles defined by the change). Project management focuses on the tasks to achieve project requirements. Change management focuses on the people impacted by the change. Any change to processes, systems, organization structures and/or job roles will have a technical side and a people side. Project management and change management have evolved as disciplines to provide both the structure and the tools needed to manage and realize change successfully on the technical and people side. The project team outlines the specific activities for defining and prescribing how to move from point A to point B (by changing processes, systems, organization structures or job roles). The change team outlines the steps needed to help the individuals impacted by the change do their jobs in the new way (for example, people transitioning from fulfilling Function A to Function B as shown below). The goal of project management is to effectively deploy resources in a structured manner to develop and implement the solution in terms of what needs to be done to processes, systems, organizational structure and job roles. The goal of change management is to help each individual impacted by the change to make a successful transition, given what is required by the solution. Change management and project management are tools that need to be applied independent of the actual change that you are undertaking. Anytime you alter processes, systems, organization structures or job roles, you need a structured approach to manage both the technical side and the people side of the pending change. Do project management and change management look the same for every initiative? Typically not. While the right amount of project management and change management is at least some, each of these tools are at their best when they are customized for the unique situation that you are facing. Your organization, its culture and history, and the specific change that you are implementing all influence the right amount of project management and change management. How Much Project Management is Needed? The amount of project management depends on the complexity and degree of the change to existing processes, systems, organizational structure and job roles. How Much Change Management is Needed? Change management engagement depends on the amount of disruption created in individual employees’ day-to-day work. It also depends on the organization’s attributes, such as culture, value system and history with past changes. 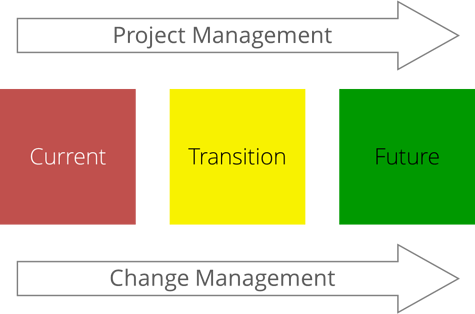 While separate as fields of study, on a real project change management and project management are integrated. The steps and activities move in unison as teams work to move from the current state to the desired future state. As an example, think about what activities occur during the planning phase of a project between both teams. The most effective projects integrate these activities into a single project plan. It can be difficult to separate out the change, project management, and change management. In practice, these three components are intertwined in order to deliver a positive outcome to the organization. However, there is value in separating out the components. The design of the change? The technical steps, activities or resources (project management)? How individuals are accepting or resisting the change (change management)? Think about what each component is trying to achieve (see the table below) and use this to describe change management in context of the change and project management.